The majority of our home insurance claims are for accidental damage, so we offer you the option to add cover for this to your home insurance policy. We’ve all done it. It takes just a split second to accidentally kick over that glass of wine but then time morphs into slow motion as you watch in horror while the dark red liquid hits your carpet and spreads outward. But what now? Once the stain is there, will it ever come out? Before you reach for the phone - and your wallet - to shell out for expensive professional stain removal, why not try these cleaning hacks for removing some common stains? Before trying any of these tricks, make sure to try a small inconspicuous area first, such as the back of your sofa or a corner of carpet. Not every type of fabric or colour can be cleaned without professional help. The last thing you want is an even bigger mess to clean up! Use paper towels to dab and blot, not rub as you’ll likely end up with little bits of tissue all over the place. 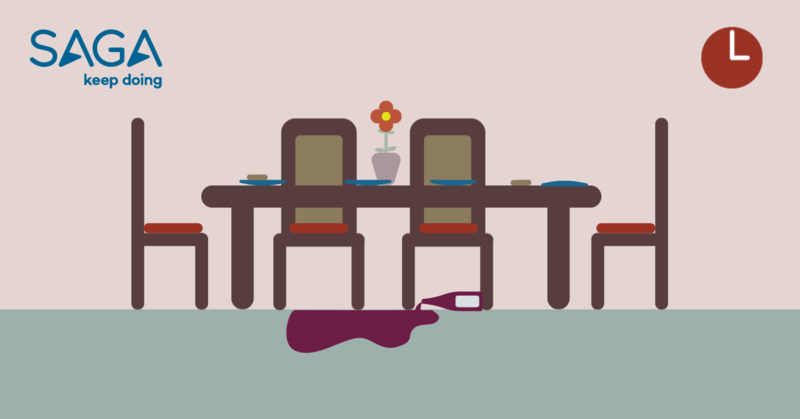 One of the most dreaded stains, red wine is known to be devilish to remove. The trick is to blot as much as possible while it’s still wet. This isn’t a stain you want to leave until the morning after to tackle. The solution you’ll need to use to clean up the spillage differs for upholstery and carpet. If the wine’s spilt on your sofa, mix one tablespoon of washing up liquid with two cups of cool water. However, if it’s on your carpet, make up a solution of one tablespoon of washing up liquid, one tablespoon of white vinegar and two cups of warm water. Using a clean, white cloth dab the stain with the solution. Ensure to blot regularly until the liquid is absorbed. This stops the area getting too wet and the stain from spreading further. Repeat until the stain has gone. If you’re using the washing up liquid/vinegar solution on your carpet, sponge with cold water and blot dry. Et voila! Should your stain be too large to tackle or too ingrained for these stain removal hacks to work, you might have to replace your carpet or furniture. Before you do, it might be worth giving your home insurance provider a call as you could have cover under the accidental damage section of your policy. lightly into the stained material and watch it disappear in front of your eyes. You may have to repeat the process a couple of times to remove the mark completely. Decorating disaster? Spilt emulsion on the carpet doesn’t have to spell a new carpet. Make up a solution of one and a half teaspoons vinegar, one and a half teaspoons laundry detergent and two cups of water. Dampen a clean cloth with your solution and sponge away the paint before it sets into the carpet. Rinse with cold water to remove the remainder of the solution and dry the carpet with paper towels – don’t rub. If your grandchildren spill fruit juice on your favourite armchair or on the carpet, don’t worry. Blot the spillage as much as possible and then pat with a wet sponge or cloth. Next, pop to the bathroom and find the shaving cream. Squirt this onto the stain before wiping clean with a damp sponge. It’s as easy as child’s play. Disclaimer – This article does not constitute advice. If you follow any of the tips within the article, you do so at your own risk. Saga Group Plc does not take any responsibility for any damage caused.